At Tesoro's you are greeted with a warm and gracious welcome by owner Tony Vitucci instantly making you feel at home and like you’re part of the family. 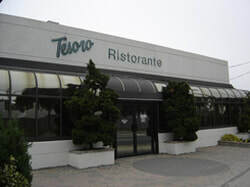 Tesoro has a 31 year reputation for serving fine food in comfortable surroundings. The waitstaff, most of them here for years, are professional, courteous, knowledgeable and very efficient. The dining room is divided into separate dining areas including small private rooms around the perimeter and at the center is an open space. The bar is set apart from the dining room by an etched glass partition. The restaurant is decorated in shades of green and light wood tones and table cloths and fresh flowers grace the tables. This REBATE is only valid with confirmed iGotAppetite.com online reservations and cannot be used in conjunction with or combined with any other discounts, promotions, or gift certificates.